By the time you are reading this, it will be 2018 and the beginning of a new track season! See the calendar with the track days for Pacific Raceways and the Ridge Motorsport Complex. All days at Pacific are on Fridays and the last day, September 23 will be on a Sunday. Oye, May 11 seems like a million days away for the speedy 318is TRAKCAR to be back on track! Watch for additional announcements via Around the Sound and the new, overhauled website. You could be reading my thoughts on how much fun it is to attend a Car Control Clinic (CCC) or a High Performance Driving Education (HPDE) event. However, I asked Andy Wiest, who has clearly been bitten by the driving bug. Andy first attended the 425 Motorsport event last spring that introduces driving events to the members. He attended a CCC, then all of the remaining HPDE events. So, rather than me telling you how much fun it is, read Andy’s version! Pardon the title pun, but planning for and participating in your first BMW High Performance Driving Education (HPDE) event can be daunting. I hope to help with that in this article so that you can confidently participate in your first HPDE. From the expense, to taking time off from work, to shopping for a helmet, it can feel pretty intimidating. I did my first HPDE season in 2017. I don’t have any car guy stuff in my background prior to about 2012, either wrenching or pushing cars to their limits, so this was all new to me. I had a 2008 335i E93 but it was a convertible, so BMW CCA regulations stipulate that no convertibles are allowed at HPDE events, so I shopped around for a coupe that would work well on the track. I ended up with a nicely used 135i E82 (which my wife found for me, but that’s another story). And to dispel any rumors, no your car doesn’t have to be a BMW. It should also be noted that people come from all walks of life to participate in HPDEs with many types of cars, from 2002s to E30s to the latest M4s. Don’t let what you think others might think about your car stop you! I found the HPDE/CCC community to be very welcoming, no matter what your car or status in life. It is definitely not elitist. First, the prep work. BMW CCA does a good job of setting up reasonable requirements to participating in an HPDE, primarily for safety reasons, but also so that you, the participant, can feel comfortable and confident on your first outing. You will need a SNELL certified helmet. (Get a 2015 version; they are only certified for ten years.) Costs vary from ~$300 to over $1,000. You may also look to borrow one from a friendly BMW CCA member if you aren’t sure you want to do more than one event. You will also need a track inspection by a certified mechanic (I took mine to BMW of Seattle). 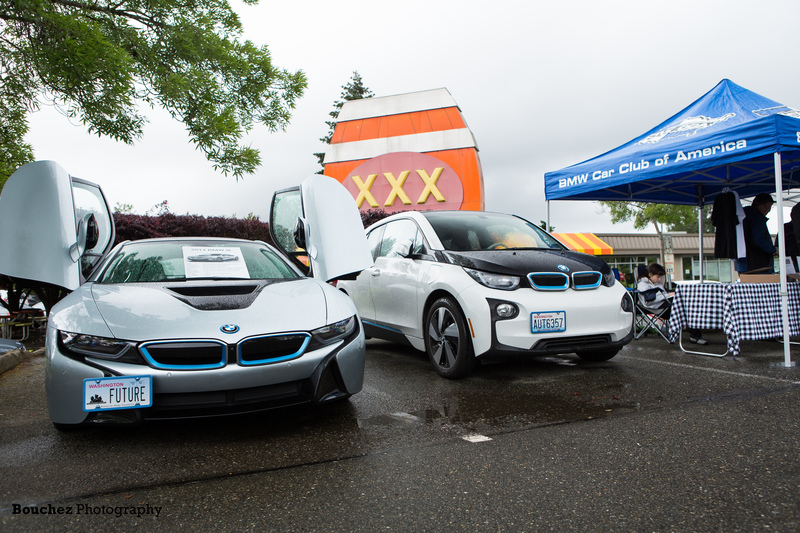 The form can be found on the Puget Sound BMW CCA website. I recommend you go to the tech session event the Club puts on in the spring. 425 Motorsports in Bellevue hosts this event. Steve Libby and Jeff Butler had a video, a presentation, and a Q&A session that were very helpful in understanding what HPDE events are all about. You also get to chat with HPDE veterans and instructors. The event is free, and 425 offers a discount on stuff in the store or that will be ordered. I got a good deal on some gloves (not required for HPDE but good to have). Most importantly, you are able to try on a variety of helmets, something that you cannot do on-line! The folks at 425 are very knowledgeable and helpful. You will also be advised to do some online courses, which I found to be worthwhile. I did the Performance Driving 101 course from Speedsecrets.com and it was well worth the money to simply understand the physics and terminology of performance driving. This course is the product of Ross Bentley, our homegrown driving guru. The next required step will be participation in a Car Control Clinic (CCC) if you have no track experience. These are great events on their own to help you understand how your own car behaves at the limits in a safe environment with a trained instructor in the passenger seat monitoring and guiding you. Doing a Car Control Clinic will improve your level of knowledge and understanding of driving dynamics, period. A final note on insurance; most insurance companies do not cover HPDE events. While the risk is very low of having a wreck during an HPDE, I personally felt more comfortable getting supplemental insurance for the event. Links to the Lockton Insurance site are available through the MotorsportsReg site when you sign up for the event. Lockton Insurance is sanctioned by BMW CCA. So, my big day arrived in June. I had the helmet, I had gloves (not required, but really cool), I had my inspection sheet, and I had completed the CCC the month before. I was ready to start learning at the novice level. And this attitude is key; the HPDE is not a race-school. It is not a time trial. It is an educational experience that is also great fun. If you approach it with the right attitude and the respect for your car that the CCC hopefully taught you, I guarantee you will have a great experience. If you think you know everything now, try to impress your instructor, try to go to limits like you did in the CCC, you will be spending a lot of time in the paddock talking to your instructor. So, I arrived early (always arrive early), gave Dana Lantz my inspection sheet and got my wrist band for the track and my lunch tickets, the schedule for the day (which you also probably received via email the week before), and found a parking spot. Other drivers were there and were very open to answering questions. There are four classes of HPDE drivers, based on experience and ability; A is the instructor level, D is for novices, like me. 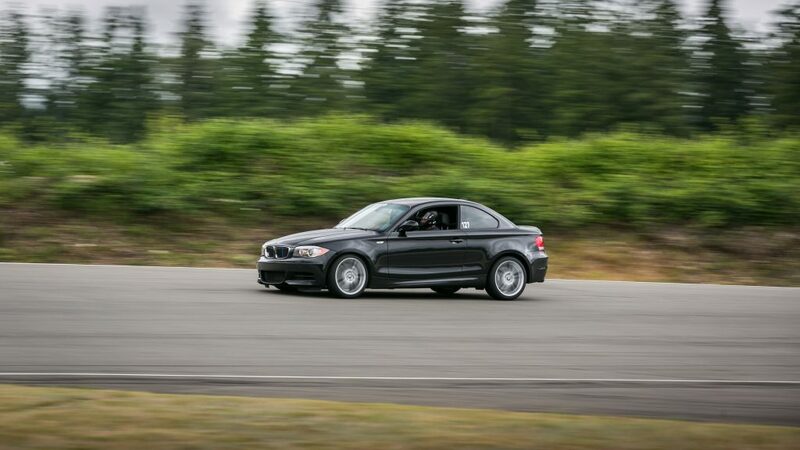 The classes are chosen by the BMW CCA instructors, not self-selected, so it adds safety and margin to fun. You then must go to a drivers’ meeting given by Steve Libby, the club chief cheerleader. The meeting covers important information on driver courtesy, course etiquette, let-by zones, what the flags mean, and safety protocols. After this, you should start getting ready for your first session. There are 16 sessions per day of 20 minutes each. It will be a repeating order like B, C, D A, for each session. Keep track of the time and be ready 15 minutes early your instructor may wish to talk to you before you head out. Speaking of being ready, make sure you have a torque wrench and a tire pump (there are inexpensive versions of each available), or borrow them. Expect to check your lug torques before each session and, on your instructor’s advice, let a few pounds of air out of your tires they heat up on track. If you plan on driving at the track more, I would suggest making a track box, a plastic box to hold stuff like window cleaner, towels, torque wrench, extra oil all neatly organized. My instructor was Larry and he was great very friendly and also happened to have experience in a 135i so was able to give me personal advice. Try not to be nervous and listen carefully to what your instructor tells you. If you think about it, these are pretty brave people getting in a stranger’s car and heading out on a track to go 100+ mph. Respect their input and ask a lot of questions. I promise they will help you out. One thing you should definitely take advantage of, if offered, is to ride in an instructor’s car; this is eye-opening to see how these cars can be taken safely to limits (as well as humbling to see how far you have to go but in a good way). My ride in Larry’s M4 was awesome. After each session there is typically a class debrief where the instructors for each run-group go over the intricacies of the track, corners, and answer driver questions. At the end of the day, thank your instructor, thank Dana, and clean up your area. Finally and I cannot stress this enough don’t drive home like you drove on the track! Trust me it is tempting to do so. Hopefully this article gives you some first-hand experience to encourage you do an HPDE this year. It’s fun and the instructors’ and drivers’ community are awesome. In the end, the cost is not exorbitant and the requirements are reasonable. For reference, I also participated in an SCCA Track Night in America event last year, and while it was less expensive, there are fewer barriers to entry (no instructor in the car, self-selection to your class, and self-certification of your car). I felt much less confident in the drivers around me at the SCCA event than the HPDE. To be clear, both types of events are safe and fun, I just prefer the BMW CCA HPDE structure. Hope to see you out there at the May 11 event at Pacific Raceways. I have the black 135i with number 127. Stop by and say “Hi” or borrow a torque wrench! Now, it is your turn. Start thinking about the 2018 driving season. Watch for ATS announcements for the 425 Motorsport event on February 24, a Saturday morning!